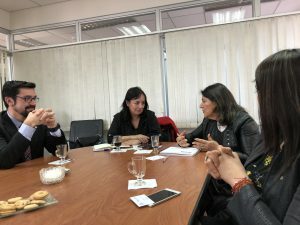 On October 12, 2018, the Chilean senator, Sen. Carmen Gloria Aravena, visited the University of La Frontera. During the meeting, the senator internalized the main aims and objectives of the MACH project, within the framework of the SATREPS initiative of joint collaboration between the Chilean government and Japan, with the support of JST (equivalent to CONICYT in Chile) and JICA of Japan. In this opportunity, Professor Milko Jorquera Tapia, the Chilean leader of the project commented the importance of including the microbiological factor from a holistic perspective in the study and in early prediction of red tide blooms. Senator Aravena, graduated from the Faculty of Agricultural and Forestry Sciences of the University of La Frontera, together with Professor Jorquera, Associate Professor Acuña, the director of the Scientific Nucleus BIOREN (Professor María de la Luz Mora) and director of the IDER Institute (Ms. Fabiola Ramos), among others, exchanged opinions on the scope and future projections of the MACH project. These included the social application of future achievements and products obtained from the research, the generation of a consortium between the academia, government and the productive sector, which involves both artisanal fishermen and civil society. In addition to Prof. Jorquera, Dr. Kawai (Kyoto University) and Mr. Misu (JICA) from Japan participated.